CD Projekt RED doesn't believe in rigid story structure, so you can spend your fifty hours of play as you please. Every event in the The Witcher 3: Wild Hunt should have some kind of impact on, or reference to, the main plot, CD Projekt RED believes, but it sees the main plot more as a theme, not a sequence of events. The story will be all around you, and it's up to you to decide whether you want to spend all your time fighting undead, or worry about the war that's ravaging the countryside, in the fifty-plus hours of gaming Witcher 3 intends to provide. This philosophy even extends to the ending. "We don't have multiple colors of endings in our game," says CD's marketing man Michał Platkow-Gilewski. "I don't know if there's anything like a bad ending or a good ending. It's just the way you played." Quest designer Jakub Rokosz prefers to think of the ending as a consequence of the player's choices, not a predetermined outcome set in stone by the plot. "You decided that the world should be shaped this way," says Rokosz, adding "If you don't like it, you can try it again." One way in which you might be able to accidentally shape the game world is by accepting, or not accepting, the surrender of an enemy NPC. Witcher 3 will use a morale system; if the enemy gets too scared of you, they may give up, but if you don't accept their surrender and kill them instead, this could come back to bite you. Or maybe you do accept, and later they go on to kill friendly NPCs. "Or join up with his friends and have another ambush for you," Rokosz points out. 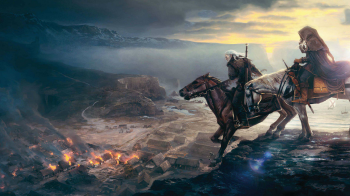 There are all kinds of options, and a huge amount of detail is being poured into Witcher 3's open game world. "We always try to make our characters and our world believable," says Platkow-Gilewski. "But one day you'll have to judge whether we've done enough work on that or not." This title's been announced for PS4 and PC and, if all goes well, will have a 2014 launch.